The Upper Darling Salt Interception Scheme is located on the Glen Villa reach of the Darling River, 35km south west of Bourke, on the Bourke to Louth Road. The $6.5 million scheme is jointly funded by the NSW Government and the Murray Darling Basin Authority. Work began in the early 1990s, with further work funded in 2000. Prior to construction there was a significant period of public consultation with local Aboriginal communities and other stakeholders. 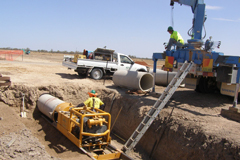 Stage 1 was completed in the 2009/10 financial year and included the construction of the pipeline infrastructure for the scheme. Stage 2 started in mid August 2010 and involves the construction of detention basins, drilling of production bores and the installation of electrical and mechanical equipment. Practical completion of the project was achieved in December 2011. The project is expected to be officially opened by June 2012. The department will operate and maintain the scheme. The Upper Darling Salt Interception Scheme will reduce the salinity of the Darling River by diverting groundwater flowing from saline springs in a critical area of the Murray-Darling Basin. Salt interception schemes use a series of groundwater bores with pumps that collect salty groundwater before it reaches a river. The pumped salty water is carried by pipes to specially engineered basins, away from the river. Saline springs were reported in the Glen Villa area from the time Europeans encountered the Darling River in 1829. Limited investigations in the early 1990s developed a conceptual model of the inflow of fresh and saline groundwater into the Glen Villa reach of the river. An interception pumping rate of five megalitres a day was identified as being sufficient to stop the saline groundwater reaching the river when the Darling River is flowing at less than 4,500 megalitres of water a day. Long-term records of stream flow between Bourke and Wilcannia indicate the salt interception scheme can reduce electrical conductivity by at least 3.54 EC units (a measure of salinity concentration) in the water of the Murray River at Morgan, South Australia — the point of measurement for the Murray-Darling Basin Salinity Strategy. Intercepting salt before it enters the Darling River will reduce salinity in the river, improve its environmental health and reduce the salt load reaching Menindee Lakes. Aquatic ecosystems and communities downstream of the salt interception scheme will benefit from improved water quality. Residents of the town of Broken Hill will be able to draw drinking water with lower salinity from Menindee Lakes. The net present economic value of the benefits of the Glen Villa salt interception scheme for the Murray-Darling Basin is estimated at $5.1 million including improving urban water quality for downstream users, particularly Broken Hill water supply, and salinity offsets for irrigated agriculture.